From “the Orthodox Word” no. 162, page 48. "Teaching from the Bishop Ioan, hermit and hesychast* in the mountains at the Agaia monestary in Moldavia." the bishop and hermit, is to read in the book “Spiritual conversations with Romanian Elders”. for the true practising christian. A. Carnivores, who always eat meat. These are in the lowest degree of fasting, even if they sometimes restrain themselves from food. They are never able to advance in prayer. B. Lacto-vegetarians, who never eat meat, but only milk, cheese, eggs, and all kinds of boiled vegetables. These are in the second degree of fasting, which is kept by monks in coenobitic monasteries and, very rarely by laymen. C. Vegetarians, who eat only vegetables and boiled or raw legumes. This arrangement forms the third degree of fasting, and the most zealous monks of the common life keep it. and the most ascetic desert-dwellers. D. Fruit-eaters, who eat bread and uncooked fruits once a day, without otherwise ever tasting food. He who attains this degree of fasting is able to master his body and thoughts without difficulty and can advance rapidly on the path of prayer. desert-dwellers – who eat once a day only black bread, cereals, and soaked (sprouted) grains of wheat, corn, millet, lentils, beans, peas, etc. F. Dry food is the sixth degree of monastic fasting, which is usually attained only by the most zealous desert-dwellers. Those who live in this harsh asceticism eat only dried bread soaked in water, with salt or a little vinegar, once a day and by measure. This is how the hesychasts of the Nile valley lived. 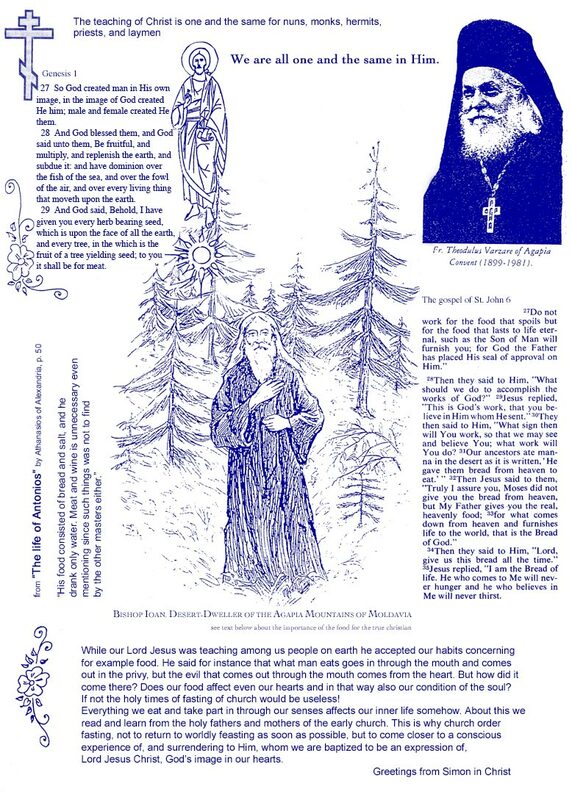 G. Divine food or manna is the last and highest degree of monastic fasting, which is attained by very few ascetics after prolonged asceticism, being strengthened by the grace of the Holy Spirit. These are satisfied with the Most Pure Mysteries alone, that is, with the Body and Blood of Christ, which they receive once or twice a week, without tasting anything else but water only. 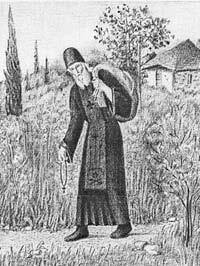 After difficult temptation and asceticism, and by the grace of God, I have come to be satisfied with the Most Pure Mysteries alone, and no longer feel hunger, or have need of bread and vegetables. “The Lord takes care of me, I feel neither the cold of winter, nor the intense heat of the sun, nor hunger, nor thirst, nor any other earthly need." ”Father Theodulus continues; 'I noticed then that this great hesychast* did not want to talk long, so as not to interruped the Jesus Prayer which he had in his mind and heart, I thanked him from my heart for the counsels and profitable words he had given me. I made a prostration to him, kissed his hand and asked his blessing to leave. And the holy Bishop Ioan blessed me with the sign of the holy cross and said to me': 'May our Lord Jesus Christ bless you and forgive me'." * The inner continous Jesus Prayer is characteristic of the hesychast (from Greek hesykia, state of piece, resting in God) spiritual activity of the eastern piety and mystery. "The Fathers, being kindled spiritually, naturally did not need much of material food with calories. Their usual food was nuts, dried fruit and honey. They never ate meat, eggs, milk, butter or cheese, nor food cooked with oil...and they were very healthy. Even for Easter instead of eggs they boiled potatoes and dyed them red." From "Elder Hadji-Georgis The Athonite 1809-1886"